If you had to make someone learn something, would you decide to teach them it, or write a short comment on a piece of paper and hope that they learn it? Yet that is not too far away from what we do with marking. After reading students’ work, there are often better ways to address areas for improvement than with individual written feedback. Most involve teaching. If I mark a set of essays, it is rare that every student has an entirely unique target for improvement. More realistically, there are about four or five targets, most of which are identifiable after a handful of books. Many students will even need all of those targets to improve. Instead of wasting time writing all of these targets out in books, lump them together and model a response which meets the targets. Particularly useful for extended writing or longer mark questions, you can ensure that you model how to meet these targets, directing questions to the students who made particular errors. For example, to the one who forgets to use quotation marks, start to write the quotation and ask them “what’s missing?” and “why do we need these?” I have exponentially increased the amount of modelling I do this year, and feedback modelling is an important part of it. As I mentioned above, students tend to have similar targets. It’s very likely that marking identifies ‘batches’ of students with the same targets. Because it’s quite inefficient to write the same comment multiple times, why not just teach them in a group? It’s often worth looking at the errors that seem to persist despite feedback in books, then teach them. For example, things like comma splices are much easier to explain and model than give written advice for. I have written before about our in-class interventions at DKA, and this is just the same, but after marking. It helps if you create the classroom culture where students are able to work independently while the teacher concentrates on groups. Classroom layout can also play a part in making this easier, and spaces where you can work with small groups and still have a good view of the class are recommended. When you read work, take snapshots of excellent examples, then display them one by one and unpick them with the class. Pupils love working out who each belongs to and it’s great for the person who wrote it. It’s also useful to look at these examples and see what can be improved. It feels safer to offer constructive criticism on a good example from a pupil you have already praised. The best models will have examples which reflect the common errors of the class. In half an hour, you can read a set of books, work out the areas for improvement, choose the examples and then plan your lesson. This is something I have seen used by @Mrhistoire, @mrthorntonteach and @jofacer which I have been using when marking homework. I am asking KS4 students to write an essay a week so this has been essential in making that manageable. I read their essays, complete this and simply teach the key errors. One thing I am aware of is that students might spend a long time on their work so to see it come back with no written comments could be disheartening. By making a big deal of the ‘appreciations’ and giving public praise in class and in our morning line-up, positive behaviour logs, phonecalls home and the appreciations bulletin, I think this will be ok! Students get a copy of this, highlight their names and then I teach what is in the second box. Let’s say students are writing for half an hour. In that time, teachers can get around every student and have a look at their work. Teachers are pretty good at spotting a misconception with a ten second glance around the room at mini whiteboards, so you can bet they’re even better with much longer looks at books while students work. Often, it can be addressed there and then, allowing students to improve instantly. Or perhaps you can use a marking proforma like the one above, and you won’t even need to take the books in to mark! If timed right, you can have all students complete a task, decide the next steps and teach them what they need at the end of the lesson. All of these methods work because the teacher looks at the work, identifies what needs to improve and then targets it through teaching. The elephant in the room is that leaders expect to see written feedback, schools often have inflexible marking policies, and therefore some of these methods become less efficient because we have to make them visible. It is hard to see the desire for written feedback go away completely, but with some of these more efficient, less time-heavy methods, the argument may start to be won. Teachers can then focus on the best way to give feedback- teaching. 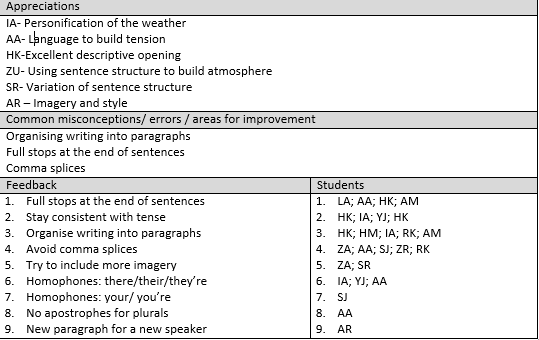 Further reading: Look at the excellent work they are doing at Meols Cop High School: Stop writing feedback comments…and see what happens!